ohann Joachim Quantz (1697-1773) was a German flutist, flute maker and composer. He composed hundreds of flute sonatas and concertos, and wrote On Playing the Flute, a treatise on flute performance. Quantz was born as Hanß Jochim Quantz in Oberscheden, near Göttingen, in the Electorate of Brunswick-Lüneburg. He began his musical studies as a child with his uncle's son-in-law (his blacksmith father died when Quantz was young; on his deathbed, he begged his son to follow in his footsteps), later going to Dresden and Vienna. He studied composition extensively and pored over scores of the masters to adopt their style. During his tenure in Dresden, he abandoned the violin and the oboe in order to pursue the flute. He studied with Pierre-Gabriel Buffardin. It was during this time as musician to Frederick Augustus II of Poland that he began to concentrate on the flute, performing more and more on the instrument. 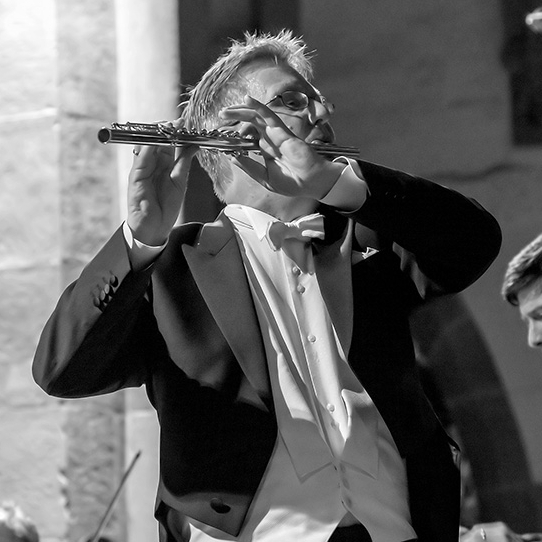 He gradually became known as the finest flutist in Europe, and toured France and England. He became a flute teacher, flute maker and composer to Frederick II of Prussia (Frederick the Great) in 1740. He was an innovator in flute design, adding keys to the instrument to help with intonation, for example. He often criticized Vivaldi for being too wild when he played. Although Quantz wrote many pieces of music, mainly for the flute (including around 300 flute concertos and over 200 sonatas), he is best known today as the author of Versuch einer Anweisung die Flöte traversiere zu spielen (1752) (titled On Playing the Flute in English), a treatise on traverso flute playing. It is a valuable source of reference regarding performance practice and flute technique in the 18th century. Quantz died in 1773 in Potsdam. iovanni Battista Sammartini (c.1700-1775) was an Italian composer, oboist, organist, choirmaster and teacher. He counted Gluck among his students, and was highly regarded by younger composers including Johann Christian Bach. It has also been noted that many stylizations in Joseph Haydn's compositions are similar to those of Sammartini, although Haydn denied any such influence. Sammartini is especially associated with the formation of the concert symphony through both the shift from a brief opera-overture style and the introduction of a new seriousness and use of thematic development that prefigure Haydn and Mozart. Some of his works are described as galant, a style associated with Enlightenment ideals, while "the prevailing impression left by Sammartini's work... [is that] he contributed greatly to the development of a Classical style that achieved its moment of greatest clarity precisely when his long, active life was approaching its end". He is often confused with his brother, Giuseppe, a composer with a similarly prolific output (and the same initials). Giovanni Battista Sammartini was born to French emigrant and oboist Alexis Saint-Martin and Girolama de Federici in Milan, in what was Austria during most of his lifetime and Italy today. He was the seventh of eight children. He received musical instruction from his father and wrote his first work in 1725, which was a set of vocal works (now lost). Not long after, he acquired the positions of maestro di cappella at Sant'Ambrogio and to the Congregazione del Santissimo Entierro in 1728. He held the position at Sant'Ambrogio until his death. Sammartini quickly became famous as a church composer and obtained fame outside of Italy by the 1730s. Over the course of the years, he joined many churches for work (8 or more by his death) and wrote music to be performed at state occasions and in houses of nobility. Although he never strayed far from Milan, he came into contact with many notable composers including J.C. Bach, Mozart, Boccherini, and Gluck, the latter of whom became his student from the years 1737 to 1741. Sammartini's death in 1775 was unexpected. Although he was highly regarded in his time, his music was quickly forgotten, and was not rediscovered until 1913 by researchers Fausto Torrefranca, Georges de Saint-Foix and Gaetano Cesari. However, most of his surviving works have been recovered from published editions from outside his hometown of Milan. Sammartini is mostly praised for his innovations in the development of the symphony, perhaps more so than the schools of thought in Mannheim and Vienna. His approach to symphonic composition was unique in that it drew influence from the trio sonata and concerto forms, in contrast to other composers during the time that modeled symphonies after the Italian overture. His symphonies were driven by rhythm and a clearer form, especially early sonata and rounded binary forms. His works never ceased to be inventive, and sometimes anticipated the direction of classical music such as the Sturm und Drang style. he Flute Concerto No. 1 in G major, K. 313, was written in 1778 by Wolfgang Amadeus Mozart. Commissioned by the Dutch flautist Ferdinand De Jean in 1777, Mozart was supposed to provide four flute quartets and three flute concertos, yet he only completed two of the three concertos, K. 313 being the first. The Andante for Flute and Orchestra K. 315 may have been written as an alternative slow movement for this concerto, but there is no extant manuscript and it is therefore difficult to ascertain Mozart's intentions clearly (this also means that current editions are based on the earliest editions rather than an autograph). The piece is scored for a standard set of orchestral strings, two oboes (which are replaced with two flutes in the Adagio movement), and two horns. he Symphony No. 21 in A major, K. 134, was composed by Wolfgang Amadeus Mozart in August 1772 and has the scoring of two flutes, two horns, and strings. he hallmark of the South-west German Chamber Orchestra Pforzheim is its fresh and gripping musical approach and stylistic diversity from early to contemporary music. The ensemble consists of fourteen musicians of seven different nationalities and is one of the few full-time chamber orchestras in Europe. This allows for exceptional richness and flexibility of sound, which is maintained even when the Orchestra is enlarged with further wind or string players. The ensemble was founded in 1950 by Paul Hindemith's former student Friedrich Tilegant. 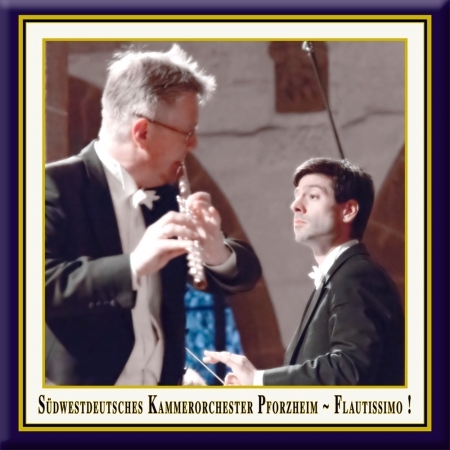 Soon the ensemble won international recognition: One talked of the "Tilegant-sound", which could not only be heard at the festivals in Salzburg, Lucerne and Leipzig as well as on world-wide tours, but which was also documented on numerous recordings. Maurice André, Dietrich Fischer-Diskau, Frans Brüggen and Yehudi Menuhin are only a few of the celebrity names who have worked with the Orchestra. After the Tilegant-era, which ended far too early after the premature death of its founder in 1968, the Orchestra was moulded by the Viennese Paul Angerer (1971-1981), Vladislav Czarnecki (1986-2002), who came from the Czech music tradition, and Sebastian Tewinkel (2002-2013). To shape and develop sound, style and program in the future Timo Handschuh has assumed the position of the orchestra's music director with beginning of the concert season 2013/14. 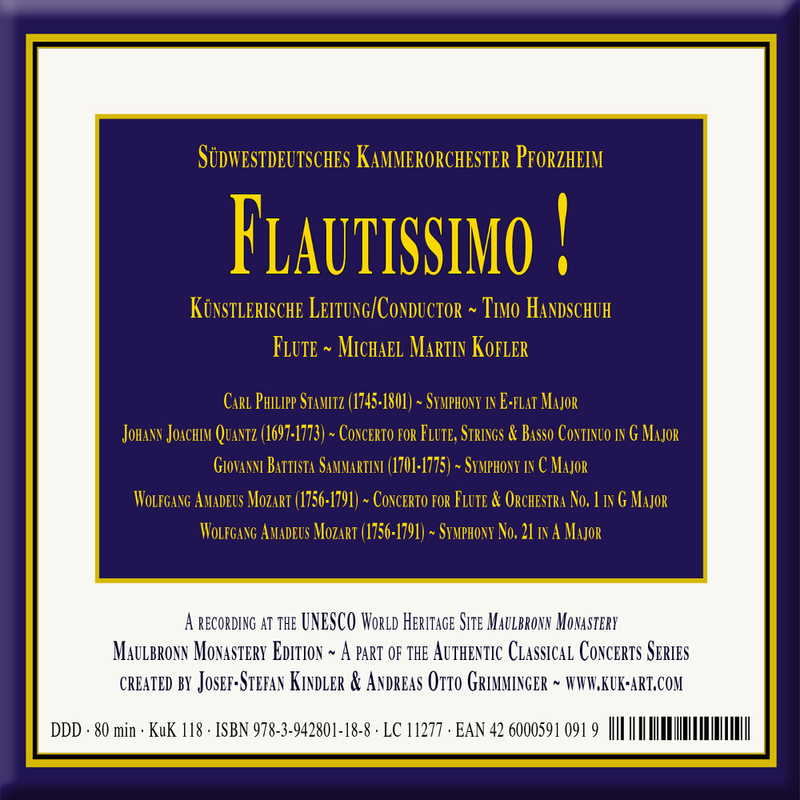 On its road to success the South-west German Chamber Orchestra has made numerous broadcasts for almost all European radio stations and released nearly 250 records and CDs, many of which were awarded international prizes (Grand Prix du Disque, Monteverdi Prize, Prox Artur Honegger). Several premiere performances (Jean Françaix, Harald Genzmer, Enjott Schneider) prove its competence in contemporary music. Currently the Chamber Orchestra plays together with renowned soloists such as Gidon Kremer, Rudolf Buchbinder, Christian Tetzlaff, Sabine Meyer, Frank Peter Zimmermann, Mischa Maisky and Anatol Ugorski. Together with them - but also with up-and-coming young musicians - the Orchestra has been invited to perform in all European countries as well as in the USA and Japan. Ideas for new programmes beyond the traditional subscription concerts extend the ensemble's profile. In 2001, the South-west German Chamber Orchestra toured Europe's great concert halls with Giora Feidman and Facundo Ramirez, playing Klezmer and Argentinian folklore (Misa Criolla), and the ensemble continues to tread new paths with American violinist Monique Mead to win young audiences for classical music ("Classic for Kids"). The Orchestra recently recorded a newly composed score which was mixed with original soundtracks of the Comedian Harmonists and performs other projects of chamber opera, dance (Flamenco with Nina Corti) and marionette theatre. 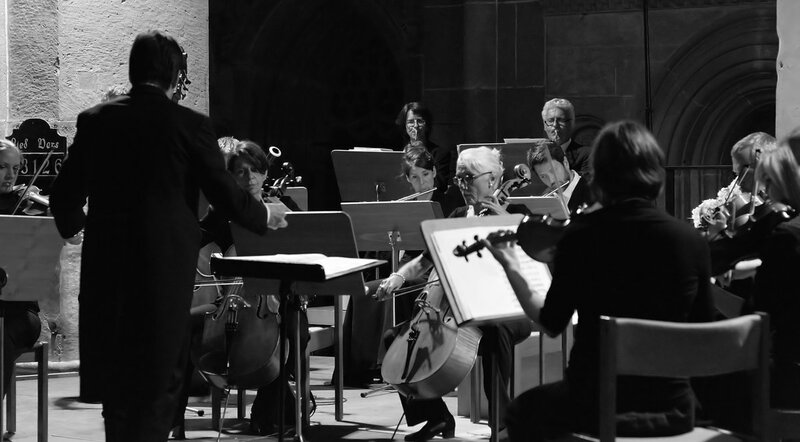 A concert recording from the church of the German UNESCO World Heritage Site Maulbronn Monastery, July 18th 2014, in cooperation with Sebastian Eberhardt.